British ranking agency Quacquarelli Symonds (QS) has recently ranked 23 Pakistani universities among the top 500 Asian universities for 2019, up from 16 in 2018. Other South Asian universities figuring in the QS top universities report are 75 from India, 6 from Bangladesh and 4 from Sri Lanka. 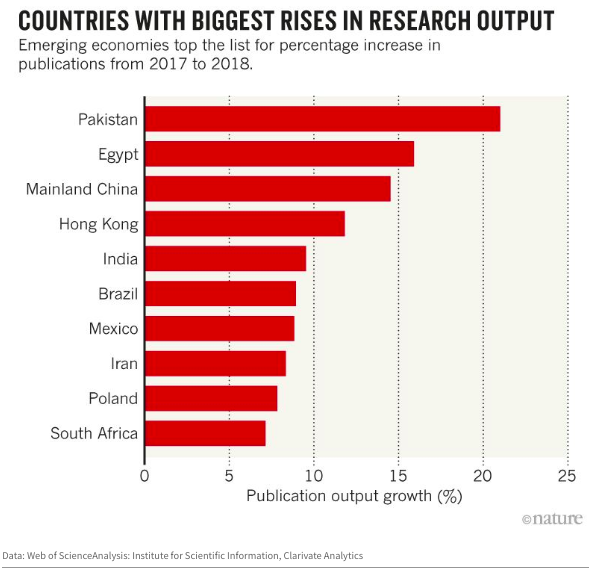 Pakistan is among the world's top two countries where the research output rose the fastest in 2018. Pakistan's quality-adjusted scientific output (WFC) as reported in Nature Index has doubled from 18.03 in 2013 to 37.28 in 2017. 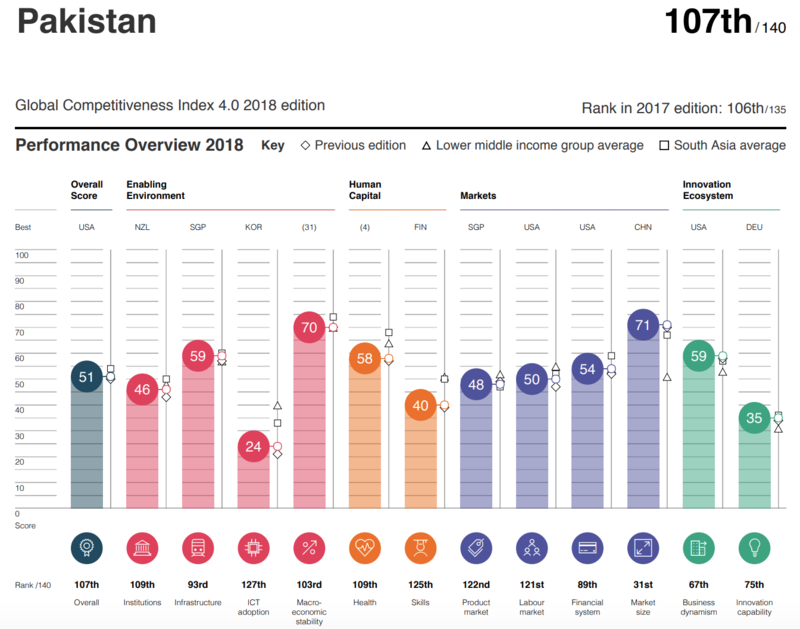 Pakistan's global ranking has improved from 53 in 2013 to 40 in 2017. 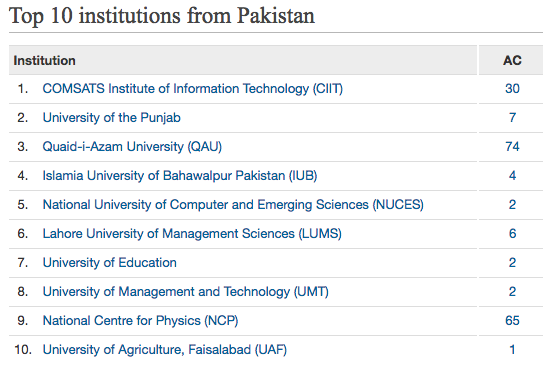 Pakistan ranks 40 with quality-adjusted scientific output of 37.28. India ranks 11 with 935. Malaysia ranks 61 with 6.73 and Indonesia ranks 63 with 6.41. Bangladesh ranks 100 with 0.81. Sri Lanka ranks 84 with 1.36. In a report titled "Pakistan: Another BRIC in the Wall", author Lulian Herciu says that Pakistan’s scientific productivity has quadrupled, from approximately 2,000 articles per year in 2006 to more than 9,000 articles in 2015. During this time, the number of Highly Cited Papers featuring Pakistan-based authors increased tenfold, from 9 articles in 2006 to 98 in 2015. British ranking agency Quacquarelli Symonds (QS) has recently ranked 23 Pakistani universities among the top 500 Asian universities for 2019, up from 16 in 2018. Overall, 2018 saw Pakistan's economy buckle under increasing pressure, with decreasing foreign exchange reserves, increasing trade deficit, circular debt as well as foreign loans taking a toll on macroeconomic health. As a result, the economy suffered while resources were diverted to handling power crises, import bills, and other issues. The country's foreign exchange reserves also remained under pressure. Given that this was an election year, the outgoing PML-N government presented a populist budget, considerably slashing income tax slabs which put a further burden on the economy. After Islamabad witnessed a regime change, the newly elected government increased taxes on utilities and luxury goods to mitigate the deficit. Side by side, a significant depreciation in the value of local currency also played a role in increasing inflation. Meanwhile, friendly countries came forward to rescue the country's economy. The Kingdom of Saudi Arabia (KSA) and the United Arab Emirates (UAE) provided a lifeline of $3 billion each to maintain foreign exchange reserves. The KSA additionally provided a deferred payment facility of $3bn, while the Abu Dhabi Fund for Development financed eight development projects in Pakistan with a total value of AED1.5bn, including AED931 million in grants. During the first half of the year, a tax amnesty scheme was launched for foreign asset holders. During the outgoing year, stricter regulations were imposed by the State Bank of Pakistan and the Securities and Exchange Commission of Pakistan on asset inflows and outflows. The central bank also raised its policy (target) rate by 150 basis points (bps) to 10 per cent near the end of the year. Here's a look at the major developments on the economic front throughout the year. This demonstrates the opportunity presented by the Fourth Industrial Revolution, which can uplift people by merging the physical, digital and biological worlds to create a better quality of life and "harnessing and converging technologies in order to create an inclusive, human-centred future".